The procedure is aimed at stimulating microcirculation and the natural processes of collagen production and regeneration. (It has also been successfully used for hair restoration in cases of non-androgenic alopecia). Micro-punctures are applied by hand, in the region of the most prominent wrinkles or skin changes, and by Phi NeedlePen system for the wider facial skin areas. Microneedles penetrate the skin to the depth of 0,2 – 0,75mm and the procedure is considered to be painless. During the treatment, specially designed and patented Solution is being applied to the skin surface and subsequently absorbed. After the treatment, the client is issued with special kind of aftercare product (Ultimate skin Cocktail and PhiSoothing cream) followed by detailed instruction for use. Proper aftercare products application is of great importance. Treatment results include: skin hydration, increased skin tone and smoothness causing existing wrinkles to be less visible and skin younger looking. Results become visible 24 hours after the procedure and shall last for a few months. The procedure is repeated up to three times ten to fourteen days apart. After the procedure, the skin will be red and flushed in a similar way to moderate sunburn. You may also experience skin tightness and mild sensitivity to touch on the area being treated. This will diminish greatly after a few hours following treatments and within the next 24 hours the skin will be completely healed. After 3 days most visible erythema will be absolved. Phi-Ion treatment is based on creation of series of minute dots adjacent to the tension lines on the skin. This process triggers an instant contraction and tightening of skin fibers to create a lifting, remodeling and rejuvenating effect. Phi-Ion pen uses the plasma state of matter. The principle involves the ionization of gases from the atmospheric air to create micro electrical discharge causing sublimation of the excessive/sagging superficial skin layer. This method can be used to treat specific areas of concern without damaging the surrounding tissue or applying unwanted heat energy to them. Phi-Ion pen is a practical portable device that uses a precise focused beam of plasma energy to sublimate the superficial layer of the skin (epidermis), without causing any damage to the underlying or adjacent tissues. Phi-Ion treatment provides baggy eyelid correction, can be used for wrinkles tensioning-crow feet, marionette lines, it is used for acne scars improvement. It is also able to remove skin blemishes (advanced training required). 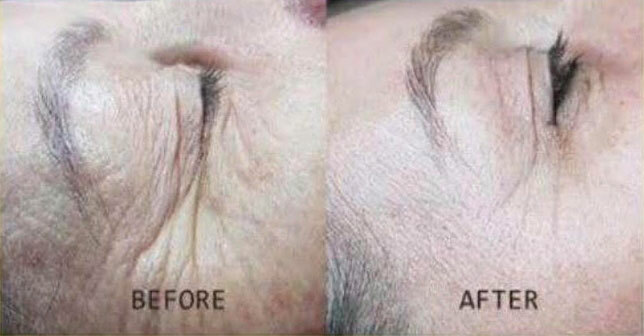 This revolutionary method is capable of achieving results comparable to the results of the cosmetic surgery. If you require more information or you would like to book a treatment, please call us on 0121 444 4763. If you have selected Telephone, what would be a good time to call? Please provide us any additional comments / information that may assist us with your enquiry. Microneedles penetrate the skin to the depth of 0,2 – 0,75mm and the procedure is considered to be painless. Results become visible after 24 hours and will last between 9 and 24 months. Please allow 7 days for Acne and Stretch Mark treatments. Will I receive a follow up consulation? Yes, with all Phi Lings treatments a FREE follow up consultation will be scheduled 2 weeks post treatment. No. But a FREE initial consultation will be required before any treatment can commence. Clusters of yellowish spots up to 0.2 mm in diameter will appear in the treated area and remain visible up to 5 days. Eye lids may get swollen and the client may feel tingling. There is no after treatment cream that needs to be applied and the client can use foundation to cover the treated area. All side effects should disappear within 7 to 10 days. This is to certify that PhiLings Palette Treatments are performed in compliance with all measures of the utmost importance for client safety. We only use the highest quality products. The needles and sharp instruments are sterile and disposable. All components of the equipment that come in contact with the clients skin are for one time use, sterilised and in separate sterile packing. Micro Needling products are non-toxic, sterile and certified by the National Healthcare Authority. Microneedling solutions are packed as monodose products for single use on on client only. - Before and after each procedure hands are sanitised properly. - Wearing sterile disposable gloves and lab coat as well as a mask in all phases of the procedure. - Containers for products are small, disposable and eliminated after being used for each client. - Protection sheet (e.g. Paper) placed over the linen is disposable and changed after each client. Dirty and contaminated linen are washed with hot water (95 degrees) with an appropriate detergent. - Workplace is suitable and meets certain criteria according to hygienic standards. The floor and all surfaces are covered by waterproof materials, easy to clean and to disinfect the room where the procedure is carried out. - The room where the procedure is carried out is separated from waiting, cleaning and sterilised rooms. Hygiene measures and post care instructions related to the client after the treatment must be followed strictly to prevent and side effects and to ensure best possible results. We comply with a strict code to achieve a beautiful look for each client which has been developed exclusively ad PhiLings.